The title of this post was definitely inspired by the movie How to Lose a Guy in 10 Days. Remember when Andy wrote her "how to in reverse" article about all of the wrong things women do with men? Well this is my "how to in reverse" post about all of the wrong things people do at events, musicals, plays, performances, etc. -When you're trying to pick a seat, discuss it in a normal voice with the people you came in with. -And then when you decide what seat you want, make sure to knee the people in front of you when you sit down. -Squeak the chair when you sit down as well & adjust as often as possible. -Don't silence your cell phone. -But if you do decide to turn your phone off during the event, make sure it makes a noise when it shuts down. -Bring mints & candy that have plastic wrappers & unwrap them during the event. Keep in mind on this one, take your time & be extra loud with it. -Sigh often during the event. -Cough & sneeze often as well. -If you're going to whisper, whisper LOUDLY. -Kick the chair in front of you. -Ask your chair-neighbor how to use your camera. -And be sure to leave the flash on when you take a picture (or 100). 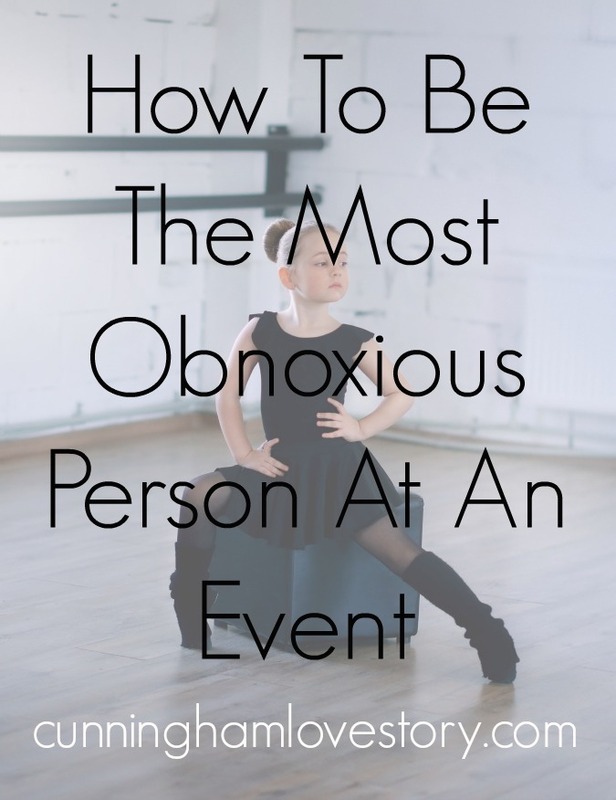 Keep in mind, only do these things if you want to be the most obnoxious person at an event. If you don't want to be "that person," do the opposite of these things. You're welcome.